Baking bread is one of the most difficult forms of cooking. 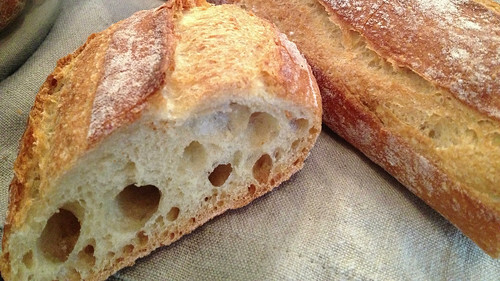 A baguette might have a few as four ingredients: flower, water, salt, and yeast. It is utterly simple, but a fantastic baguette is one of the most sublime of all culinary experiences. Yet the difference between a great baguette and a passable one is very subtle. Put an amateur baker next to a master and ask them both to make you a baguette. Give them the same ingredients, the same professional equpment, and the same amount of time. Watch them work. If you don’t have much experience with baking you might not be able to see the differences in their approach and technique. The master will look more relaxed and controlled, of course, but relaxation is not the difference. You might not be able to identify what the two of them do differently. But be sure that you’ll be able to taste it. The master’s bread with have better texture, better flavor. The crust will be snappier, and the inside will be fluffier and more elegantly yield to the pressure of your teeth as you chew. The tang of lactic acid and alcohol from the fermentation will be beautifully balanced, and it will have little to no starchy or grassy, underdeveloped taste. The amateur will have no idea what they did wrong. If they watch the master closely they will definitely learn something. But they won’t be able to reproduce the master’s creation. Not right away. Not without hundreds or thousands of hours of practice. Next, have both of these bakers make a pizza. Give them the same San Marazano tomatoes with which to make a sauce, the same dry-cured linguica, roasted garlic, and heirloom red sweet peppers. All they have to do is make the crust, assemble their pizzas, then bake them in the same wood burning clay pizza oven. How different do you think the two pizzas will be? The master’s crust will be better, of course. That probably means their pizza will be better. Crust is, after all, very important. But the difference will be nowhere near as dramatic as the baguette, even though pizza crust and baguettes are very similar forms of bread. There is also every chance that the amateur baker makes even better tomato sauce than the master. After all, this is a master baker we are talking about. Not a master tomato sauce maker. The thousands of hours spend learning to knead and proof bread don’t necessarily translate to blending the flavors of tomato, onion, and basil into a perfectly seasoned and integrated sauce. And we all know there is more to great pizza than just the crust. Elegant and beautiful prose is one of the hardest forms of writing. You might not be able to write as well as James Joyce, Toni Morrison, or David Foster Wallace. You might never be able to write as well as they do. Not everyone can become a master baker, no matter how much kneading they do. But a story is more than just prose. It has characters, and conceptual framework, and dialogue. Not all of us can make amazing baguettes. The simpler something is, the more subtle and transcendent the skill-set needed to make it truly magnificent. But every writer can learn to make great pizza. Work on your tomato sauce. Or your garlic roasting ability. Or figure out a combination of ingredients no one has ever tried before. All that matters is that it’s delicious.